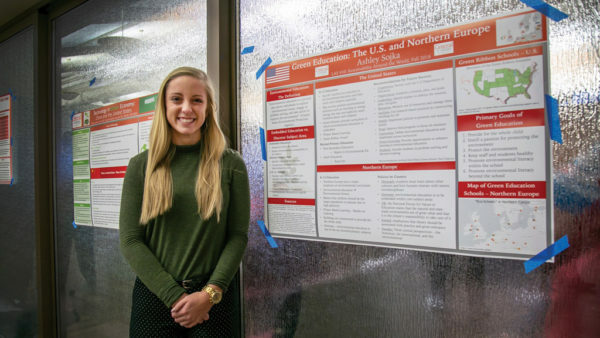 Ashley Sojka ’19, above, was one of more than 150 Central students representing 25 courses across 15 academic disciplines who presented research results to the campus community Dec. 4 in the Harry and Bernice Vermeer Banquet Hall. Through oral presentations, poster sessions and demonstrations, Undergraduate Research Symposium participants shared what they learned through research for classes, honors symposia, summer projects and independent study. Presentations ran the gamut: One computer science student built his own video game. Other students studied cultural controversies such as the treatment of Confederate monuments or wilderness access or tested hypotheses in the experimental and social sciences. All projects featured researchers delighted to do out-of-the-classroom work with real-world applicability. Elementary education major Sojka, for instance, studied how sustainability is taught in the United States versus Northern Europe. “The United States tends to offer specialized courses in sustainability; in Northern Europe, they embed green education in all classes. Theirs is a broader approach, and knowing about it has influenced how I plan to teach,” she says.